The first forgotten check on the federal government can be found in the Constitution of 1787’s Article I, Section 3 and it states: “The Senate of the United States shall be composed of two Senators from each State, chosen by the Legislature thereof for six Years; and each Senator shall have one Vote.” In other words, Article I, Section 3 required each state’s legislative body, rather than its citizens, to choose its two U.S. Senators. This Senate provision was the original instrument that ensured “State Rights” in the legislative, executive and judicial branches of the federal government because all presidential nominations for executive and judicial posts take effect only when confirmed by the Senate, and international treaties become law only when approved by a two-thirds vote of the Senate. From 1789 until 1913, United States Senators served, essentially, as ambassadors of the individual states to the Federal Government. Senators unequivocally represented their States’ interest and took instructions directly from the legislative branch of their respective state governments. The first significant example of state power in this regard was in 1788, when Patrick Henry, as a powerful member of the Virginia House of Delegates, used his voting block to thwart James Madison's aspirations for a seat in the United States Senate. Henry then used his influence to draw-up a Virginia Congressional District that gave James Monroe the voter advantage over Madison in the House race between two future U.S. Presidents. In order to placate Patrick Henry’s anti-federalist supporters, James Madison was forced to promise that, if elected, he would introduce constitutional amendments. Winning his home county of Orange 216 to 9, Madison won the election by 1,308 to 972 over James Monroe. Madison questioned the necessity of a federal bill of rights but was forced to face the issue early in the first House session. On June 8th, 1789, he introduced in the House proposed amendments that were primarily related to civil liberties rather than the structure of the government. Henry and the antifederalists believed Madison's proposals were a far cry from the Amendments that they had proposed at the ratification convention and, on August 13th, antifederalists introduced amendments changing the structure of the federal government and protecting the rights of the states from encroachment. The debate was vibrant and Representative Madison, due to Patrick Henry’s blocking of his election to the Senate, found himself the pivotal Congressman in framing what we now call the Bill of Rights. Under the Constitution of 1787 Article I, Section 3, U.S. Senators were also actively engaged in the election of local State legislators. When Abraham Lincoln and Stephen Douglas traveled around Illinois in 1858 debating each other as they vied for a seat in the U.S. Senate, they weren't looking for votes from the citizens. Douglas, the incumbent senator and Lincoln, who had served one term in the House, were seeking votes from the State Delegates and Senators in the Illinois legislature. For 124 years, State legislators, not lobbyists, worked closely with U.S. Senators in drafting bills to be introduced in Congress. U.S. Senators spent the majority of their time in the Senate actually conducting the nation’s business, as opposed to today’s members whose schedules are consumed with fund raising-related duties. 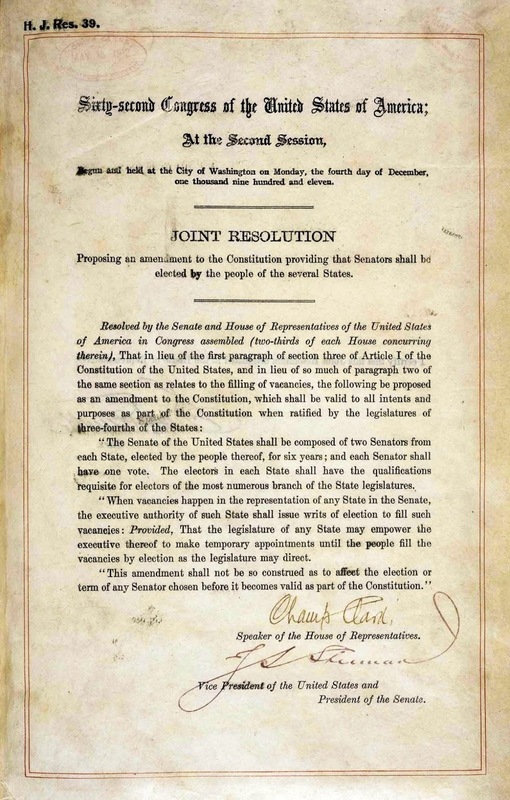 The 17th Amendment’s provision for direct popular vote elections, while purportedly giving “power to the people,” in fact stripped the States’ constitutional check over the Senate. The Seventeenth Amendment (Amendment XVII) to the United States Constitution was passed by the Senate on June 12, 1911, the House of Representatives on May 13, 1912, and ratified by the states on April 8, 1913. The amendment supersedes Article I, § 3, Clauses 1 and 2 of the Constitution, transferring Senator selection from each state's legislature to popular election by the people of each state. It also provides a contingency provision enabling a state's governor, if so authorized by the state legislature, to appoint a Senator in the event of a Senate vacancy until either a special or regular election to elect a new Senator is held. This important check of the States over the U.S. Senate was overturned by the Progressive Republicans when they voted to send the Constitution’s Seventeenth Amendment to the States for ratification on May 13, 1912. Constitution of 1787, Article II, Section 2, Clause 2. The Editorial Board, Dark Money Helped Win the Senate, Sunday Review Editorial, New York Times, 11/8/2014 - "The next Senate was just elected on the greatest wave of secret, special-interest money ever raised in a congressional election. What are the chances that it will take action to reduce the influence of money in politics? Nil, of course."